When I graduated college I had no idea that you could study something like bioluminescence, but one of my professors arranged an introduction to Jim Case, who studied marine bioluminescence at the University of California, Santa Barbara. I applied to his lab and, within weeks of arriving, I was sent on a cruise to the Bahamas with a submarine and scuba dives, and a bevy of world experts on various marine topics. 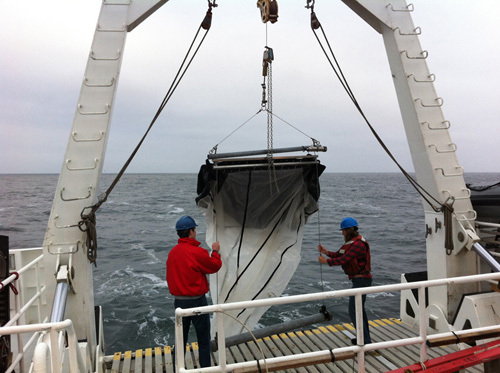 It was an education by immersion that continued throughout grad school, and involved an approach to research and exploration that MBARI supports to this very day. I think about my first research cruise often, and it weighed on my mind yesterday when I got a message from Case’s daughter that my mentor and academic parent had passed away. It was somewhat fitting to get this news while out at sea, studying diversity and bioluminescence, because those were subjects that sparked his intellectual fires. Two nights ago we all enjoyed a spectacular show of luminescence off the bow of the R/V Western Flyer under the moonless sky, and even before I had heard the news, it reminded me of cruising with Jim in the Mediterranean 20 years ago, when we watched dolphins dart about leaving illuminated trails in the waves behind them. 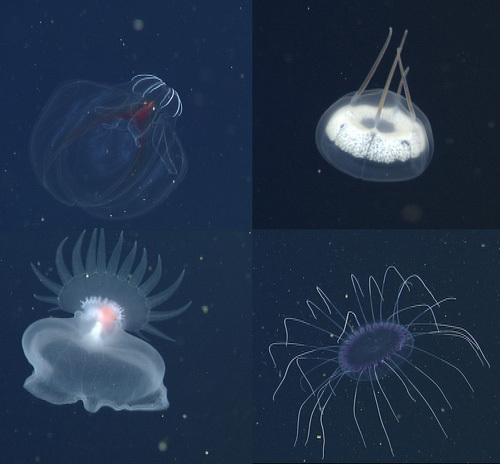 Case’s lab developed “bathyphotometers”—instruments that can quantify this type of oceanic bioluminescence and give a unique method to measure the organisms living in the water. MBARI still deploys one of these instruments on an autonomous underwater vehicle (the Dorado AUV), generating maps of luminescence across the bay that Jim could only have dreamed of when he started these efforts. Our last paper together was a review of bioluminescence that exceeded the recommended page limit three-fold (inducing a bout of carpal tunnel syndrome) and gave him a chance to air his thoughts on the evolution of bioluminescence and its place in the context of oceanography. It is amazing to think about the methods at our disposal today to study the same phenomena that have fascinated people for centuries. High-pressure liquid chromatography lets us isolate and purify bio-active molecules, transcriptome sequences provide the genes involved in luminescence, and mass spectrometry links the two data sets together to identify which genes go with which molecules. It is a different world from when Jim Case was performing his research, but his spirit of curiosity and respect for the natural world live on in the kinds of research that we are fortunate to conduct. Even the most business-like e-mail from Jim could make me laugh, and I wish I had a tenth of his wit to send him off with a bon mot. But lacking that, I’ll use his favorite phrase: FIAT LUX. 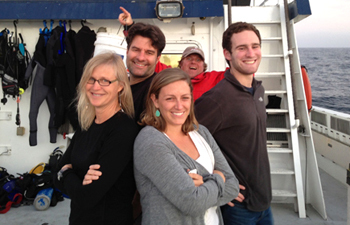 Steve Haddock, former MBARI postdoctoral fellow Christy Herren, and their graduate advisor and bioluminescence pioneer Jim Case.